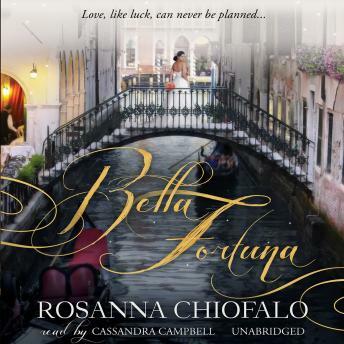 In this warm, enchanting debut novel, Rosanna Chiofalo evokes the extraordinary beauty of Venice, the charm of a close-knit New York neighborhood, and the joys of friendship, family, and surprising second chances. Valentina DeLuca has made hundreds of brides' dreams come true. At Sposa Rosa-the Astoria, New York, boutique where she, her sisters, and their mother design and sew couture knock-off gowns-she can find the perfect style for even the most demanding customer. Now it's her turn. Valentina has loved Michael Carello ever since he rescued her from a cranky shopkeeper when she was ten years old. He's handsome, chivalrous, and loyal, and in a few weeks she's going to marry him-in Venice. Just when she thinks everything is falling into place, Valentina is forced to reexamine her life to see what truly makes her happy. As she soon learns in a place as magical as Venice, what seems like misfortune can turn out to be anything but. Who knows what may be waiting around the next corner? The chance to enjoy a moonlit gondola ride, to sip Prosecco in St. Mark's Square, to eat mouthwatering gelato, to put aside "sensible" for once and see where the warm Italian breezes guide her as she visits all the sights she's dreamed of: the Doge's Palace, the Rialto, the little islands of Murano and Burano. And maybe along the way she'll discover that bella fortuna (good luck) isn't what you're given but what you make.